Setting up an account is fast, free and easy. If you are using assistive technology and need help accessing this PDF in another format, please contact us via this email address: ssd@info.collegeboard.org. 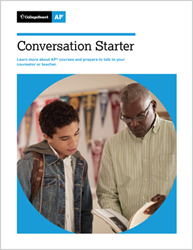 Chart an AP course to a college major or career area. AP Exams are in May, but there are other dates to keep in mind. Are you ready to test your best? Know the rules before you take your AP Exam. View your AP Exam scores online. Understand your options for reporting your official scores. You could earn an award for your AP scores. Most colleges in the U.S. grant credit for AP scores. See what your scores mean at colleges around the world. AP opens doors at colleges and universities worldwide. The AP Physics 1 course is designed to enable you to develop the ability to reason about physical phenomena using important science process skills such as explaining causal relationships, applying and justifying the use of mathematical routines, designing experiments, analyzing data and making connections across multiple topics within the course. This AP Physics 1 course is equivalent to the first semester of a typical introductory, algebra-based physics course. A practice is a way to coordinate knowledge and skills in order to accomplish a goal or task. The science practices enable you to establish lines of evidence and use them to develop and refine testable explanations and predictions of natural phenomena. Because content, inquiry and reasoning are equally important in AP Physics, each learning objective described in the concept outline combines content with inquiry and reasoning skills described in the science practices. The AP Physics 1 course and exam are organized around six underlying principles called the big ideas, which encompass the core scientific principles, theories and processes of physics that cut across traditional content boundaries and give you a broad way of thinking about the physical world. Big Idea 1: Objects and systems have properties such as mass and charge. Systems may have internal structure. This big idea collects the properties of matter into one area so that they can be employed in other big ideas. The universe contains fundamental particles with no internal structure such as electrons, and systems built from fundamental particles, such as protons and neutrons. Big Idea 2: Fields existing in space can be used to explain interactions. All of the fundamental forces, including the gravitational force and the electric and magnetic forces, are exerted “at a distance”; the two objects involved in the interaction do not “physically touch” each other. Big Idea 3: The interactions of an object with other objects can be described by forces. An object either has no internal structure or can be analyzed without reference to its internal structure. An interaction between two objects causes changes in the translational and/or rotational motion of each object. Big Idea 4: Interactions between systems can result in changes in those systems. A system is a collection of objects, and the interactions of such systems are an important aspect of understanding the physical world. Big Idea 5: Changes that occur as a result of interactions are constrained by conservation laws. Conservation laws constrain the possible behaviors of the objects in a system of any size, or the outcome of an interaction or a process. Big Idea 6: Waves can transfer energy and momentum from one location to another without the permanent transfer of mass and serve as a mathematical model for the description of other phenomena. Classically, waves are a “disturbance” that propagates through space. Colleges may require students to present their laboratory materials from AP science courses before granting college credit for laboratory, so students are encouraged to retain their laboratory notebooks, reports, and other materials. Interested in Taking AP Physics 1? Does our school offer AP Physics 1? What are the enrollment requirements? When is the deadline to enroll? See this conversation starter for more questions to ask. Want to know the AP credit policy of a particular college or university? Visit our AP Physics 1 page. AP courses can help make college dreams a reality.